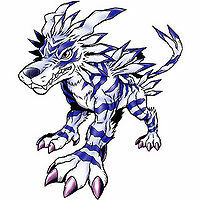 A Beast Digimon that is very similar to Garurumon. 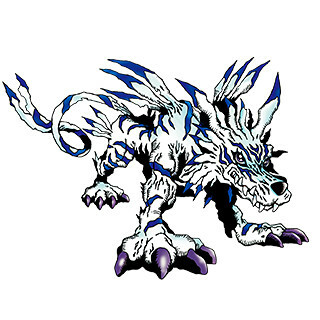 As a fiendish Digimon that lives in the dark, it is a nuisance who causes trouble everywhere. 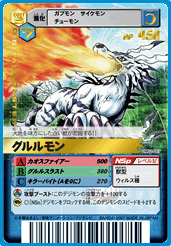 Its Special Move is high-temperature flames spewed from its mouth (Chaos Fire). 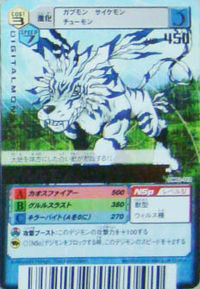 | Gururu is the sound of a growl. 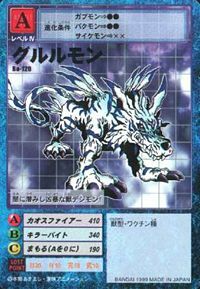 Chaos Fire  カオスファイアー Kaosu Faiā Spews high-temperature flames from its mouth, or strikes the ground to cause dark fire to rise about the enemy. Gururu Thrust  グルルスラスト Gururu Surasuto Attacks with its claws. Death Moonsault  デスムーンサルト Desu Mūnsaruto Performing a backwards somersault, it kicks the opponent. Ice Cannon  アイスキャノン Aisu Kyanon Fires balls of ice from its mouth. Killer Bite  キラーバイト Kirā Baito Bites the enemy. Antidote  アンティドウテ Antidoute Heals an ally of poison. 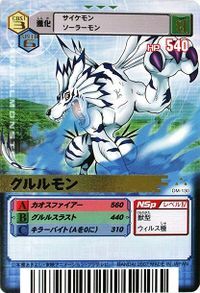 Gururumon is an obtainable Digimon. 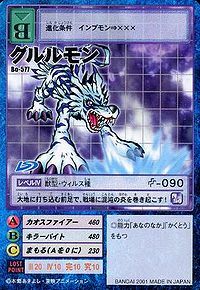 Evolves from Yuki Agumon (6+ DP) and evolves to Were Garurumon (0+ DP). 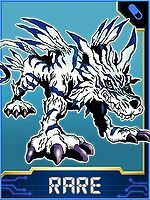 Gururumon is available as a Digimon Medal. A ferocious beast Digimon that hides in the dark! It drives its feet into the earth as it stirs its flames of chaos upon the battlefield! This page was last modified on 15 April 2019, at 22:38.